Ready for hours of take-along adventure, this adorable plush husky clip-on hooks easily to your keys, purse, belt loop, etc. This cute little husky stuffed animal clip is sure to delight with its soft gray fur, white tummy, feet, muzzle, and inner ears, fluffy white cheeks and bottom of tail, alert ears, sweet black eyes. 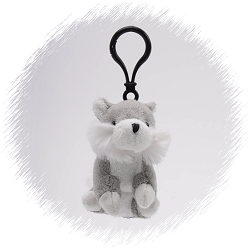 This husky plush clip-on is the perfect take-along pal and would love to accompany you on your adventures whether it is on your key ring, belt loop, backpack, purse, or even looped around your finger. This adorable little wolf plush keychain has soft gray fur, white accents, and a sweet face. This sweet German Shepherd puppy plush keychain has soft tan fur, dark brown accents, perky ears, and embroidered details. This adorable little plush gray donkey clip-on has soft gray fur, white accents, and fluffy black mane and tail tuft. This adorable little pig plush keychain has soft pink fur, hot pink accents, and a springy curly tail. This fun red-eyed tree frog plush keychain is comes in your choice of three vibrant colors... turquoise, lime green, and hot pink. Blue, this Dreamy Eyes stuffed husky (or is he a wolf? ), has soft gray fur, white accents, and big sleepy blue eyes. Howler is an adorable husky (or is he a wolf?) stuffed animal with cuddly soft gray and white fur and a sweet smiling face. Hunter is an adorable plush husky with soft gray fur, an embroidered smile, and sparkly turquoise-blue eyes. This adorable little Handfuls plush wolf / husky has a soft gray body, white accents, perky ears, and watchful eyes.